GJ 1132 is an M-dwarf star, the lowest mass and most abundant kind of star in the universe, and is one of the closest stars to the Sun known to host a planet at just 39 light-years away. While M-dwarfs are usually too faint for meaningful atmospheric follow-up, GJ 1132’s close proximity makes it a prime candidate for observing its planet’s atmosphere. Because the planet, GJ 1132 b, transits its star, its radius was previously measured to be just a bit larger than Earth’s (1.16 times larger). Its mass has also been measured to be 1.6 times more massive than Earth using the Doppler technique. The planetary transits allow for astronomers to measure its atmosphere. If the planet has an atmosphere that blocks light at only certain wavelengths, the planet will appear larger at those wavelengths. 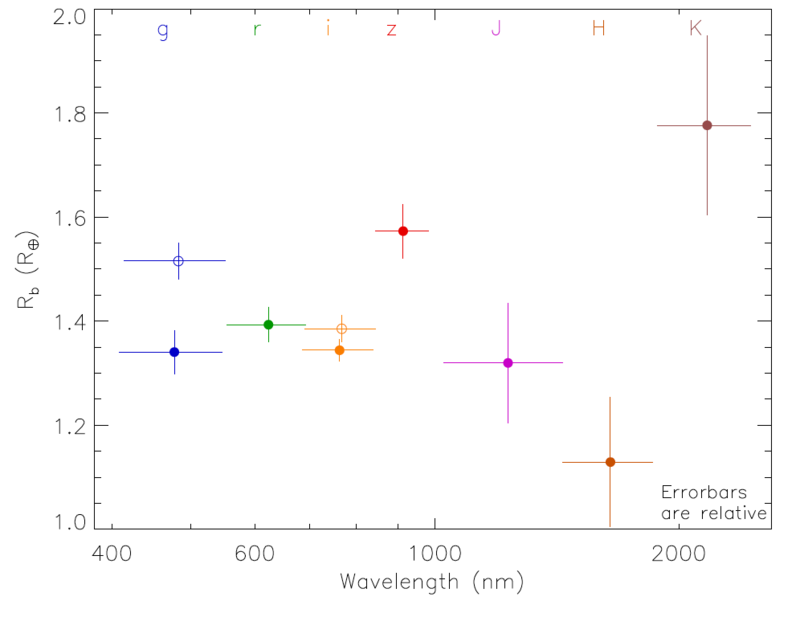 And so, the authors of this paper observed GJ 1132 b for 9 transits in several photometric bandpasses (grizJHK) from the optical to the near-infrared using the GROND instrument at the MPG 2.2m telescope at ESO La Silla, Chile, although some observations in the near-infrared bands were removed due to their low quality. The measured radius of the planet in each bandpass is shown below in Figure 1. I'm a 5th year graduate student at Yale University. My main research is on the discovery, characterization, and statistics of exoplanets. I'm also one of the science leads on the citizen science project Planet Hunters, a website where the general public can join the search for exoplanets.